Here in Australia – in the latter half of 1980, I would devour Kiss Ice Blocks at my local milk bar. Often these were consumed whilst queuing up to play Space Invaders or – the Bally Kiss Pinball. Unmasked or Dynasty were stacked in the record racks…and promoter Kevin Jacobsen was about to bring the masked ones here for a tour.Yes folks, things were indeed kissterical back then. 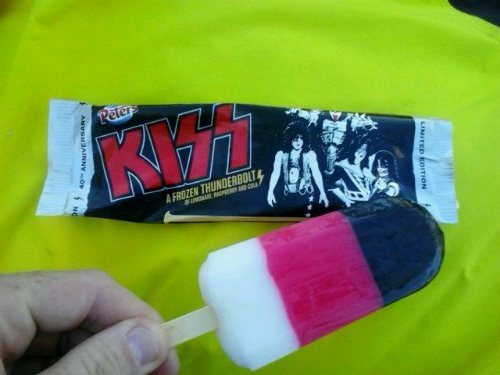 You could even buy Kiss Ice Blocks. Over the years – this rare Australian Kiss item (official Aucoin) has long been sought after by Kiss collectors, shelling out big money for an old wrapper or two.